Everyone welcome to come and sing! This is a purely social singing activity - you are not expected to be operatic! - and is accessible to people living with dementia. It's also a great opportunity to get out and meet people! 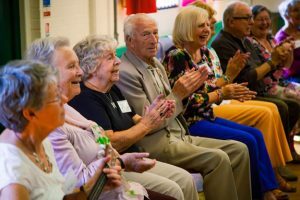 Singing has been shown to help manage various long term conditions including dementia, cancer, respiratory and coronary illnesses as well as providing a boost to combat depression and other mental illnesses. SingAbout makes you feel good! Independent Arts has 30 years' experience of providing creative activities to older people and community groups. We include a variety of music including traditional rounds and rhymes, songs from the shows and musical hall favourites, as well as popular music and rock and roll. NO musical background is necessary ... so come along and try it! Carers and family members are welcome to attend. Refreshments are provided. Our weekly, fortnightly and monthly sessions in towns across the Isle of Wight are open to all. A voluntary donation is appreciated.